[ARCHIVED THREAD] - 10.5 SBR with a blown gas ring and bent firing pin retaining pin. I recently registered my Bushmaster XM-15 16'' as an SBR. I received my tax stamp and installed a 10.5'' black hole weaponry 5.56 barrel, spikes tactical T3 buffer and an a AAC comp. I installed the extra heavy buffer because I plan on shooting it with my can sometimes when that tax stamp comes back. Today I took it out for the first time and put about 50 rounds through the rifle. When I went to clean the rifle I found that one of the gas rings had blown and the firing pin retaining pin had bent. (See pictures) Im trying to figure out if I should just buy new gas rings and a retaining pin and go on with it or if something other than previous wear could be the reason for the failure. Ammo used was the 100 round bulk pack Federal 55grain .223 FMJ from walmart. Thanks for any help. The pin doesn't look very bent. I would just replace the rings and keep shooting. I would just clean it up, replace the rings and pin, and keep going. From the looks of the bolt it has been shot a lot and has a lot of carbon build up. Scrape off the carbon from the bolt and carrier and make sure there are no burrs and that it's well lubed next range session. If it's cycling OK your spring and buffer are probably about right. You should have a better idea the next time you clean it if you actually have a problem. that pin looks like just about every one I own. You're fine. Agree on the advice to put new rings on it. McFarland Gas ring is your answer. When you put a new barrel on, you should check it for proper headspace so you do not blow up the barrel. If you are using the same lower receiver assembly as you had on the 16", and the 16" had a lot of rounds on it, then you should consider changing out the action spring (buffer spring). Also keep in mind that on the short barrel, you are not burning up all the powder, so you will see more fouling, of which fouling will cause parts to wear quicker. I would recommend changing out the gas rings, and the firing pin retaining pin. The FP retaining pin should never be bent. 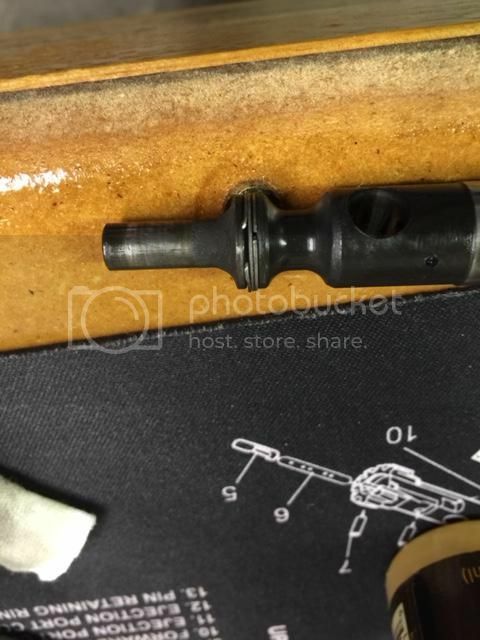 This usually occurs when a notched hammer is used with an unshielded (old semi-auto type) bolt carrier. In some applications the hammer notch can catch the firing pin and force it up, bending the pin. Bending the pin introduces metal fatigue which may cause it to break and release the firing pin, which in turn releases the bolt cam pin. This will usually have dramatic results if firing continues. Bottom line, a bent pin is a warning. Guns usually tell us things before bad things happen - its wise to listen to them. 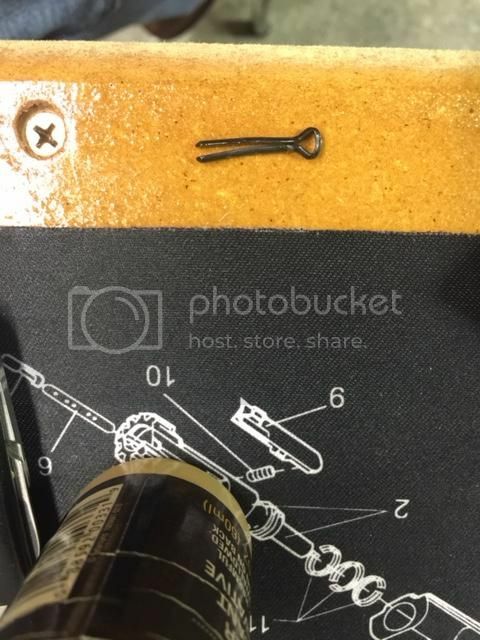 Figure out what bent the pin and relieve the situation. With how inexpensive things are right now, I would have just kept the old BCG with the old barrel and bought a complete BCG for the new barrel. If you have the money for the tax stamps, you have the money to for a $99 BCG. Best guess, gas rings are toasted since the Carrier is out of spec. Here, it would be the larger ID to small ID step in the carrier milled too far inward, and the rings can escape from the smaller channel to the larger channel as the bolt unlocks. As for FP retainer, ditto on the chances you have a L cut hammer, and the top of hammer contact edge is catching the stop collar as the B/C moves forward home. Note, when you install the FP retainer, eyelet opening front to back so the opening is in line with the front to back with the B/C, which orientates the legs stronger front to back as well. The quick check is to make sure that the FP collar is not proud of the back of carrier when the FP is seated forward, and the hammer top of contact pad is not a sharp edge. In regards to the FP collar, it can be reduced in OD but just chucking the back end of the FP in a drill and spin filing down the collar OD. In the case of the hammer, once out of the rifle, sand paper on a dropsical stick or a diamond file to slightly radius top of hammer contact edge. Note, you are cleaning up a mess that is caused by the trigger being too short from the pin channel to the front of the trigger, hence hammer not retained low enough during trigger retention. This is the route i went after destroying the gas rings on my 7.5" upper.